Dear Donald, prove us wrong, what was your golf score today? IQ, EQ, or shoe size? Apparently Trump cheats at golf. Why are we not surprised … there are terms for reasonable doubt in golf that test the limits of decorum, if not integrity. Like Caddyshack is a mulligan for cinéastes, but Happy Gilmore is a bridge too far. So from now until the end of our long national nightmare, Trump’s golf score should be a matter of public record when he plays a round, because public sphere and all. And let him refute it since we know he never apologizes or cries. Not to mention that he made Melania a golf widow on Mother’s Day. Surely his golf scores are (not) alternative facts, and his whole life is about keeping score, what with audience ratings, crowd size, voter majorities … bigly-ness with a tiny grip. A mulligan is a second chance to perform an action, usually after the first chance went wrong through bad luck or a blunder. Its best-known meaning is in golf, whereby a player is informally allowed to replay a stroke, even though this is against the formal rules of golf. We don’t have to take Samuel Jackson or Oscar de la Hoya’s word for it. Trump’s denials are much like those for his political (Roger) and criminal (Felix) associates. 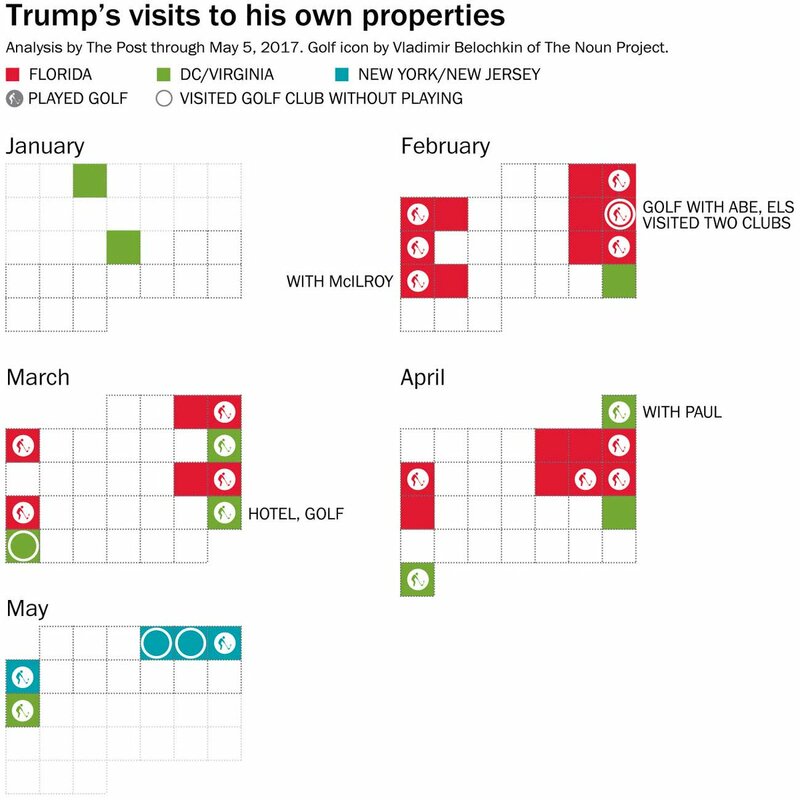 But like the suppression of WH visitor logs, whenever we find out with whom Trump played golf, we learn interesting things like impending media tactics or even personnel decisions. There are fewer mulligans in marriage or even public policy. Journalists need to do a better job about reporting his scores and identifying his playing partners. Isn’t the whole deal with Trump the pathetic elitism of a game played by an obese man who claims that exercise shortens your life. And who was present when he shot that 66. A man who says things that aren’t true is also likely to misrepresent statements that supposedly back him up. And that’s what we’re seeing now, as the White House tries to explain why Trump fired FBI Director James Comey. On Tuesday, Trump released a letter in which he said he was firing Comey based on an attached memo from Deputy Attorney General Rod Rosenstein. The memo, dated Tuesday, argued that Comey had violated Justice Department protocol by treating Hillary Clinton unfairly. Every White House spokesperson, including Vice President Pence, attributed the idea of sacking Comey to Rosenstein. Counselor Kellyanne Conway hailed Rosenstein as a “nonpartisan figure” and quoted extensively from his memo. Press secretary Sean Spicer said, “It was all him.” Deputy press secretary Sarah Huckabee Sanders declared, “When the president gets a recommendation from somebody like that, that is so well respected, he has no choice but to listen to him and to make a swift and decisive action.” Pence, when he was asked on Wednesday whether Trump had requested the memo, said that Rosenstein simply “brought that recommendation to the president,” and Trump acted on it. These stories were false. Trump had solicited the memo in a meeting with Rosenstein and Attorney General Jeff Sessions on Monday. And he had already decided, even before the meeting, that he would terminate the FBI director. Pressed by NBC’s Lester Holt in an interview on Thursday, Trump admitted: “Regardless of recommendation, I was going to fire Comey.” Trump gave reasons for his decision—including disgust with inquiries into contacts between Russia and his associates—that were completely different from the reasons in Rosenstein’s memo. Rosenstein had been set up. This entry was posted in 2016 Election, Celebrity, Cooking Techniques, FBI, Government, History, Humor, Media, Political Science, Politics, Presidential Elections, Presidents, Sports, United States and tagged Donald Trump, golf, Media, Politics. Bookmark the permalink. I do not play golf very well. I typically score about 100, but I try to better on the second nine. I got slightly under 100 the last time I played. That windmill was tough to get past. I am not a golfer, so don’t really know the rules. However, any reports of him playing Calvin Ball with the rules is totally credible. No matter who reports it; I don’t need second source verification. I can relate to how hard it is to get past that windmill. I always had trouble with the waterwheel. And why in hell is there a waterfall in the middle of the fairway?